Strange moods abound in the office. It must be Autumn. You get a button for reloading a script, and the “Edit” button will actually open your script in Komodo IDE if you have it installed on your machine, which is pretty slick. (Why Komodo? It’s what David uses on his machine.) So far, it seems to have made life better, but we are limited in our ability to make life better by our ability to remember to use it. Does this mean that the tools we use need to be in our face for us to remember how to use them? I’m not sure yet. Offices snuck into Revision 43, but they don’t really do much other than providing the backend for new Vicaring operations. 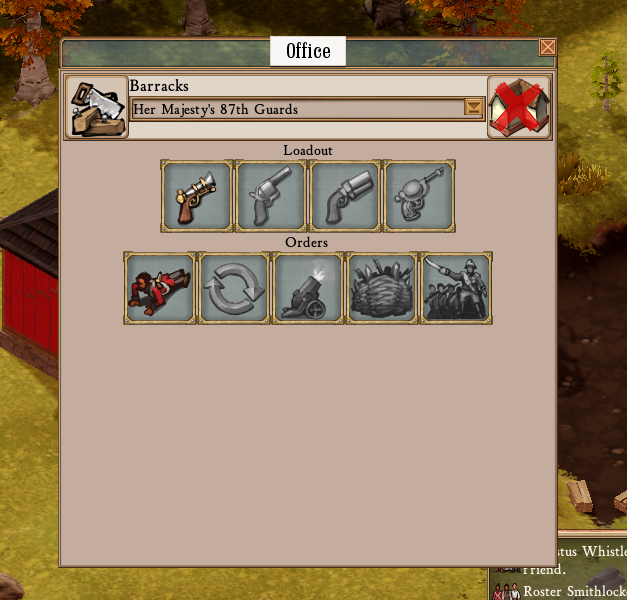 In actuality, an office consists of a big pile of scriptable UI elements that you can hook to do whatever. In conjunction with rewriting the military code to be faster/better/actually work/not drop guns everywhere, we’re adding military controls to the barracks for each unit to configure that military unit’s behaviours. The actual content of this window will, no doubt, evolve; however, you have a “boolean toggle” row (indicating what weapons this group will use), and a “choose one of the following options” order for indicating what this military regiment should do (train, patrol, man the emplacements, build military engineering projects, or assault a specific point.) Having better/programmable controls means that we are finally embarking on the military master plan, so hopefully we will stop having people dropping all their guns any day now. A lot of the code for this actually working is dependent on me finishing the new decision tree AI which runs before/after/on top of/in conjunction with the existing jobs system to handle things that aren’t, really traditionally, jobs with utility, so visible progress on this system in the experimental build may not show up for awhile. We will, I am sure, talk more about military emplacements in a bit. Daniel and David were also seized by Strange Moods on Monday, and promptly started digging into the office code. David’s mission: create a barbershop where you can receive medical treatment. We are still arguing about the role of leeches in modern medicine, but it seems like bandages might be something that you might receive in a barbershop. Daniel has been creating a Public House where people can go to sit down and receive a glass of Foaming Ale. 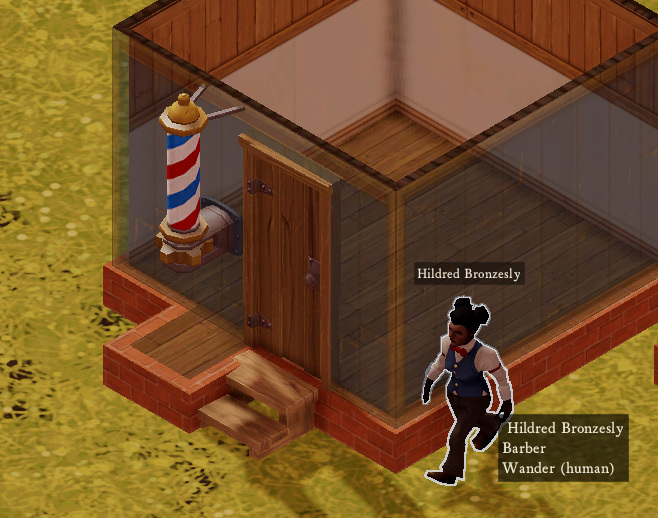 A related piece of code involves having “building supplies” for offices (A cabinet of bandages and leeches, for a barbershop; a terrifying booze vat where they just pour all the alcohol available in the colony into some sort of frothing swill for the public house), and giving the offices standing orders (“FILL THE TANKS!”) when there are no jobs in the office jobs queue to fill. Now, if you will excuse me, I have to go back to the workshop and whisper to myself about my visions for a lovingly engraved pig-tail tunic embossed with strips of dog leather. Really looking forward to having new bulidings recreate an authentic colonial high street. Although it was not really mentioned, I’m glad you’re still taking *steps* to improve the graphical feel of the game. “Autumn” yes, yes, yes, tally ho, whato! Browns and golds, acorns, apples, the drawing-in of the evening. and all that. “Autumn”. Such a lovely evocative word, together with its adjective, ‘autumnal’. the seeds of autumn in my mind.” – lyrics from ‘Autumn Tactics” by Chicane. Fact iiiis, this Sunnae, on the Good Lord’s day, we-gat aahselves an ‘Autumn Fest’val’ where we gonna press-us some apples…. … so en-nee you-folks a-wantin’ some cider you git ya good selves alahhhng an see if it taste rrreeeeal guuurrrrrd. Hot dang! On it’s way. Excited to play v43! Military is brilliant — even better if, on mousing over each weapon button, it’d display something like “Pistols: 5 total, 2 unclaimed”.